The weather was so beautiful this week. 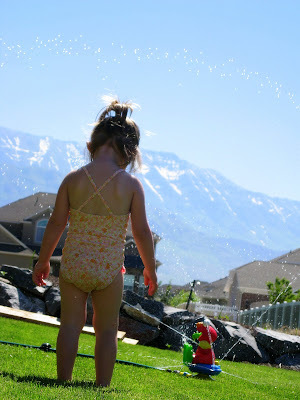 So the girls go to play in the sprinklers Thursday morning before Jade went to her ballet class. How old is this girl!!! 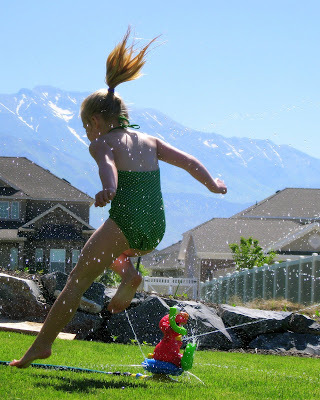 5 year olds do no lay out. Neither do two year olds. I guess mine do. I have not encouraged sun bathing and am anxious about getting sunscreen on their cute little bodies. But, I remember many many afternoons spent laying out on a towel with tanning oil getting as brown as I could. That's what happens when your mom grew up on the beach. 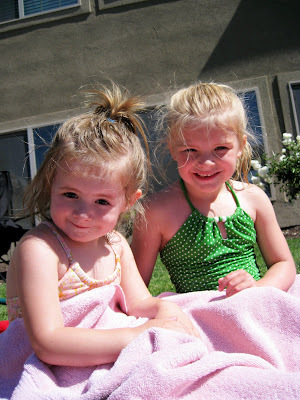 Here's an example of how different my princesses are. Jade is all about getting in and getting wet. Ivy, on the other hand, will often take her time and ease into the water.